Perhaps you will enjoy savoring writing that is well crafted. You can use leisurely reading as an effective way to prepare yourself to sleep by separating yourself from the stress-building issues you faced during the day. When you’re tired and trying to relax, try choosing titles that are escapist and gripping, but remember you’re reading to slow down and prepare for rejuvenating sleep, not to binge read chapter after chapter. Losing yourself in a book is the ultimate relaxation. This is particularly poignant in uncertain economic times when we are all craving a certain amount of escapism. It really doesn’t matter what book you read, by losing yourself in a thoroughly engrossing book you can escape from the worries and stresses of the everyday world and spend a while exploring the domain of the author’s imagination. This is more than merely a distraction but an active engaging of the imagination as the words on the printed page stimulate your creativity and cause you to enter what is essentially an altered state of consciousness. So participate in Get Caught Reading Month and Mental Health Awareness Month. Join the campaigns to reduce stress and combat depression and other mental health issues. Enjoy life and have more fun through reading! Fierce, Funny, and Female received recognition in May. 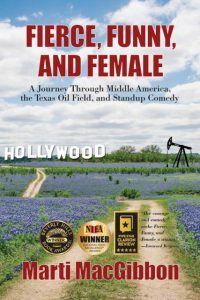 The book is Winner of the Independent Press Awards, in two categories: Women’s Issues and Humor. And it placed Finalist in the Next Generation Indie Awards, in the Memoirs of Overcoming Adversity category. You can pick up a copy on Amazon.